3M ESPE Lava Crowns and Bridges are Lava Zirconia-based restorations overlaid with an approved veneering ceramic. The zirconia copings and frameworks provide the strength while the veneering material provides the esthetics. The system is used for crowns, implant abutments, and bridges with a span of up to 48 mm in length. Tooth preparation is similar to PFM preparations with only slightly less reduction occlusally and circumferentially. Dies are scanned and then the copings or frameworks are milled and sintered. The zirconia substructure is colored with one of eight available shades, including a bleach shade, to coordinate with the final restorations. 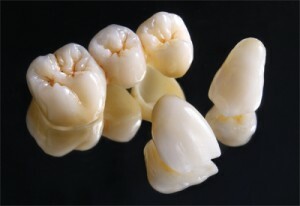 Lava restorations can be cemented with traditional or self-adhesive resin cements. Lava received a 95% clinical rating. Over 1600 Lava restorations have been placed and documented since 2003. These restorations include anterior and posterior crowns, 3- to 6 unit bridges and implant abutments. Most restorations were cemented with 3M ESPE RelyX Unicem Self-Adhesive Universal Resin Cement. 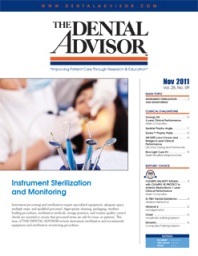 • Nine hundred and sixty-three restorations were recalled over a six-month period. The distribution of restorations evaluated is shown in Figure 1. • Restorations were rated on a 1-5 scale, 1=poor, 2=fair, 3=good, 4=very good, 5=excellent. The fracture and chipping of Lava restorations at 1, 4, and 8 years of service are shown in Figure 2. Of the recalled restorations, 29 were replaced because they received a rating of 1 or 2 out of 5. In many cases the fractures resulted in the delamination of a large portion of the veneering ceramic, and the restorations could not be polished or repaired. Forty-eight restorations received a rating of 3 or 4. These were chipped restorations that either did not need any smoothing or polishing or could be polished and smoothed satisfactorily. In many cases the patient was not aware that the restoration had chipped. The causes of the fractures could be the thickness of unsupported porcelain or possibly too rapid heating or cooling of the veneering ceramic. Rapid cooling of the restoration can result in the buildup of undesirable stresses within the restoration. None of the fractures involved a zirconia substructure or coping failure. They all involved the veneering ceramic. 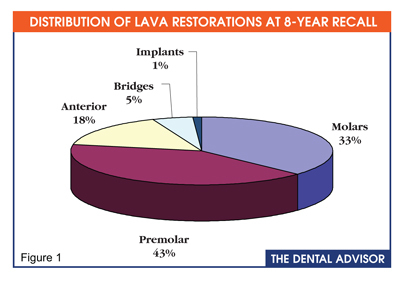 The vast majority of Lava restorations received a 5 or excellent rating for esthetics. Only 46, or 4.8%, of 963 restorations received a rating less than 5. Lava restorations have definitely superior esthetics when compared to PFM restorations, especially because the Lava coping can be shaded to closely simulate dentin, eliminating the graying caused by a metal substructure. Once the patient experiences the esthetics of a Lava zirconia based restoration, they are elated with the outcome. 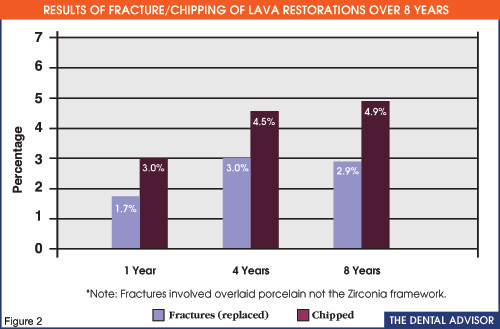 Over 98% of Lava restorations received an excellent rating for resistance to marginal discoloration. Advantages of Lava crowns are the opaque core and the zirconia coping margins can be very close to the margin of the preparation. These characteristics reduce or eliminate graying at the margin due to microleakage that can be visible in more translucent restorations. During the eight-year evaluation, only 2.1% of the restorations exhibited slight graying at the margins. Over 97% of Lava restorations received an excellent rating for resistance to wear. A small number (2.8%) of the recalled restorations exhibited some wear of the overlaid ceramic at eight years. Minimal to moderate wear was noted in about 15% of the teeth opposing Lava restorations; this wear was mostly visible in anterior teeth.